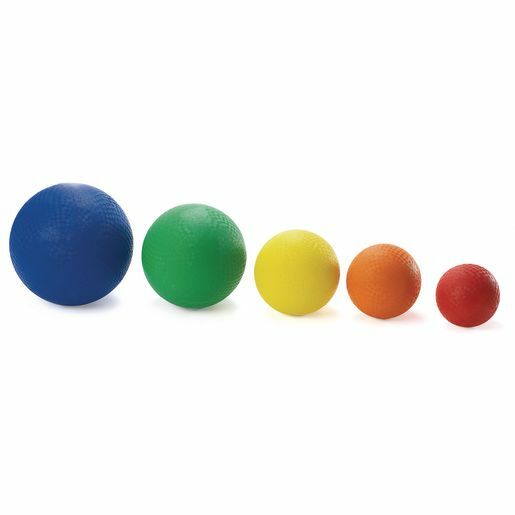 We've added even more bounce in a rainbow of colors with our new premium playground balls! Our most durable balls ever, these are tough enough to withstand every pass, dribble, shoot, kick and hit - day after day! 1 each of 5 sizes: red, 5"Dia. ; orange, 6"Dia. ; yellow, 7"Dia. ; green, 8-1/2"Dia. and blue, 10"Dia. Withstands classroom use, holds shape, gives a higher bounce, and easy for small hands to grip and handle!